Yiwen Hao is the founder of Pototaly, the world’s first potato-based organic skincare brand. It’s no accident that she’s launching a product made from the humble tuber: her family business is Landun Xumei Foods, an enormous farm-to-factory and farm-to-restaurant producer of potatoes, active in everything from processing to delivery. China is the world’s largest producer of potatoes, responsible for most of the world’s potato production. Every year, Landun Xumei makes enough french fries to circle the earth three times, if you lined them one by one. Potatoes were first introduced to China during the Ming Dynasty (1368–1644). As one of the few crops that can be grown across much of China, by the end of the 20th century, the potato had become a standard ingredient in Chinese cuisine across the country. Yiwen has been managing Landun Xumei Foods for the last eight years, on both a full- and part-time basis, since graduating from the University of Chicago Booth School of Business. This has put her in charge of one of the biggest potato companies in the country, which produces the lion’s share of the world’s potatoes. Yiwen combined her interest in potatoes, business, philanthropy and beauty, coming up with Pototaly. 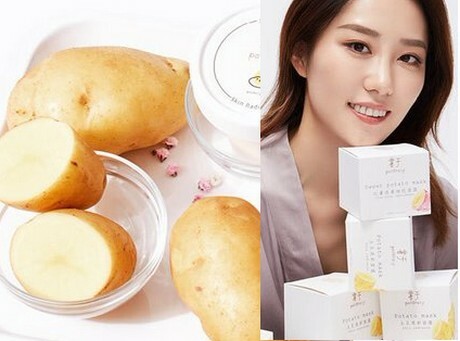 Raw potatoes have been a part of Yiwen’s personal skincare regime since she was a little girl. A traditional family remedy for a bruise is to apply potato; bruises disappear in three days instead of a week. Yiwen has long used raw potato as a facial treatment to brighten her skin and reduce anti-puffiness. Pototaly products are 100 percent organic and made from all-natural ingredients. Even the packaging is made from “potato paper,” which is recycled from potato waste. The company is dedicated to 100 percent sustainable practices, and adding only as little as nature needs to transform potatoes into an awesome skincare product. Because Pototaly is in charge of the entire production process, from farm to final packaging, quality and purity are guaranteed.